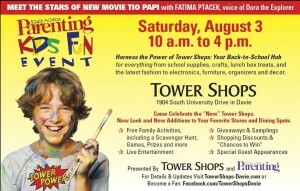 Davie, FL (July 24, 2013) – When searching for the ideal destination for back-to-school shopping that will also be serving up plenty of family fun and discounts, Tower Shops in Davie is the place to be on No-Tax Saturday, August 3rd from 10 a.m. to 4 p.m.
Tower Shops invites shoppers to “get set” for the new school year amidst on-going free interactive family activities, entertainment, celebrity appearances, a scavenger hunt, shopping and dining discounts, sidewalk samplings, games and prizes, a mini car show and more. 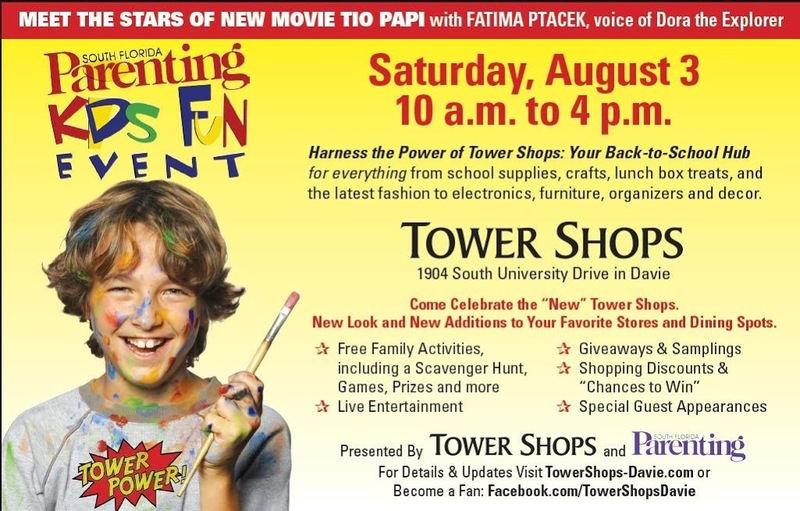 There will also be a special up-close-and-personal opportunity to meet-and-greet the cast of the soon-to-be released movie “Tio Papi,” including Fatima Ptacek, the voice of “Dora the Explorer,” from 12 noon to 1:30 p.m.
During the event, the Tower Shops’ diverse collection of more than 47 stores and restaurants will be the ultimate one-stop hub for all types of back-to-school shopping including school supplies, fashion, shoes, electronics, room organizers, lunch box treats and much more during Florida’s annual statewide tax-saving program. To make it both exciting and convenient, Tower Shops will run a special open-air train that will shuttle shoppers around the recently renovated shopping destination. 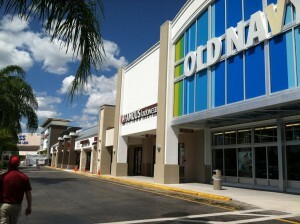 Conveniently located at 1904 South University Drive, Davie, Florida just south of I-595, Tower Shops is a 67-acre regional retail destination with a strong anchor line-up including Ross, TJ Maxx, DSW, Michaels, Old Navy, Office Depot, Best Buy and Home Depot amidst a collection of 40+ popular specialty shops, service businesses and restaurants. For nearly 25 years, Tower Shops has served the South Florida community as a popular center for fashion, dining, health and beauty, business/office needs, home improvement, arts and crafts and more. New stores and restaurants that have opened within the past year include Lane Bryant, Spaghetto Express, Tilly’s, DelVecchio’s Pizzeria, Discovery Clothing, Ulta, Kids Under 10 and BurgerFi. While individual store/restaurant hours may vary from official center hours, Tower Shops hours are Monday through Friday: 10:00 a.m. – 9:00 p.m.; Saturday: 10:00 a.m. – 6:00 p.m.; and Sunday: Noon to 5:00 p.m.
For more information on the “Power of Tower” Family Fun Event, visit towershops-davie.com, become a fan at facebook.com/towershopsdavieor call (954) 473-9619.